The soup was GOOD! I will definitely make it again. Here is the recipe in case you missed it yesterday. In a large, heavy pan, brown sausage and onion. Drain on paper towels and return to pan with potatoes, salt, water, marjoram, pepper. Simmer until potatoes are tender (about 15 minutes). Add corn and milk, heat through and serve. Serves 6. Yesterday, while working from home in my living room, I let Tucker out to go potty aroud 1 p.m. He finished his business, barked, and came back inside to hang out by my feet (as he usually does when I work upstairs). Around 2 p.m., he got my attention again and gestured that he wanted to go outside. I let him out. I went back to work. Around 4 p.m. I realized that I hadn't heard him bark so I went outside looking for him. He had dug his way out from underneath our chain-link fence. Now, this isn't all that unusual - he has done this before. As a result, DJ poured some concrete in the hole he had dug previously. Well, Tucker's a smart dog, so he just dug a new hole right next to the concrete. Anyway, I didn't think much of it and opened the garage door as Tucker likes to wander over to the neighbors and play with Maggie and Dottie once in a while. But...by 5 p.m. ... I really started to worry. Tucker wouldn't come when I called him. I walked up and down our half mile street calling his name for an hour. Still nothing. I drove around the block twice looking for him in the woods, corn fields, etc. Still nothing. Now I was starting to get really scared. I was thinking someone took him. We looked all night and I woke up with a lump in my throat this morning when he wasn't laying in his usual spot on the floor next to my bed. As soon as I got up and got Jackson and myself dressed, we headed to the human society. And guest what ... HE WAS THERE!!! I have never been so happy to see my little mutt in his four years of life. Yes, he might get on my nerves. Yes, he peed on the dining room floor three times last week. But I love him. 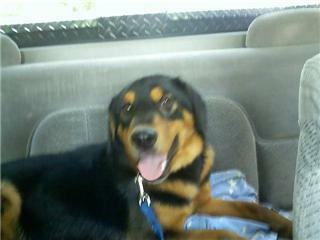 :) Someone saw Tucker walking around on Ireland Road (scary) and called the human society yesterday afternoon. Poor guy - he looked tramatized when we found him at the shelter. Right now, he's sleeping by my feet - totally exhausted. I'm pretty sure he didn't sleep in that scary place last night. I seriously couldn't handle any more bad news today. Thank goodness we found him!!! To cheer myself up, I decided to cook today. It's been at least a week since we've had a meal that I've made (although we did have swiss steak and mashed potatoes last night thanks to Grandma Ginny). So, I had some sausage dethawed from the pig we just got. After I dethawed it, I realized I don't know how to make much with sausage. So I decided to try a new recipe: Sausage, potatoe and corn chowder. Here's the recipe. I'll let you know how it turns out! This weekend was very low key, but that was okay with me. Friday night we went to Maxi's with Heidi, Justin, Colleen and Carter. Jackson kept us busy and crawled away from the table so fast that he almost made it to the kitchen before we could catch him! I bet the cooks would have been surprised to see him there! Saturday Jackson and I had a fun afternoon of baking cookies at Aunt Dawn's with Dawn and Grandma Ginny. As we were fininshing, my throat started to really hurt and I got really tired - but I just thought I was tired so I didn't think much of it. This morning when I woke up, it was a different story. My throat hurt SO BAD! I took myself to MedPoint thinking I had strep throat. Wrong! Get this...I have Hand Foot and Mouth disease! How in the world? Apparently most adults are immune to this virus and it's usually passed around kids. Well lucky me, I got it! The doctor said that Jackson likely had a mild case of it and passed it on to me. I feel like a bad mom - not realizing that he had it. I hope that he didn't have the symptoms that I'm having - surely I would have noticed. It is not fun! I have been in bed all day. My amazing husband has been taking care of me and Jackson - bringing me drinks and hanging with Buddy all day. I am so lucky to have such a wonderful family. Last week was a really difficult week. We are getting through this rough time, but I still have moments where I feel pretty sad. Fortunately, we have such a supportive family and group of friends. My dad sent me this e-mail last week: "Found a lost little turtle by Jack's favorite Fla swing this morning. Chinese lady standing by the ocean, who I had not seen before, said old proverb says 'when you put them back in the sea you don't have to worry'. Never know why things happen." I think I really had him worried for those first few days and for some reason, this woman came into his life with this 'proverb' that made him feel better. Funny how things like this happen when you least expect it. Anyway, I just wanted to say thank you to our friends and family for all of your love and support. We are so blessed to have you all. Jackson said "up" yesterday for the first time at Miss Kelly's house. He said it this morning when I lifted him out of his crib. So stinkin' cute! He does the sign for "please" like it's his job. Too funny. When you have a handful of anything food related, he signs "please" like crazy! My little guy LOVES to eat (just like his Mom). He is now mobile ... on the furniture at least. He makes his way down the couch, the coffee table etc... Now he likes to stand by himself for a few seconds and then fall and laugh. We are headed to Lake Sweetwater this weekend...can't wait! Trying to think of something fun to do with Carlee, Kendall and Trace. Last year we painted with pudding and it was a hit! Their Christmas card had a picture of the three of them COVERED in chocolate pudding. Anyone have any ideas for fun lake activities for kids age 12, 10 and 6? Can't wait to take Jack on the boat and into the water...he will love it! Woods is going with us this year and Daddy is staying home so it will be a fun time. Bring on the summer beer!